Digos City celebrates their Foundation Day called Araw Ng Digos every year in August. 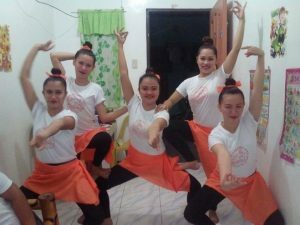 On August 15, 2016, our AMSAI School band attended the parade and performed a yoga dance in the Digos gym. The yoga dance was so amazing and added a beautiful and peaceful moment to the modern dance of the program. Our children practiced the dance for one week and the band members practiced each weekend, four times a month. In line with this, the AMSAI teachers also performed a yoga dance that demonstrated the flexibility of the body and the calmness and balance of the mind. 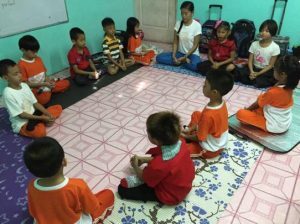 Every morning the children start the day with Morning Circle followed by a few minutes of Meditation and Yoga Exercise. 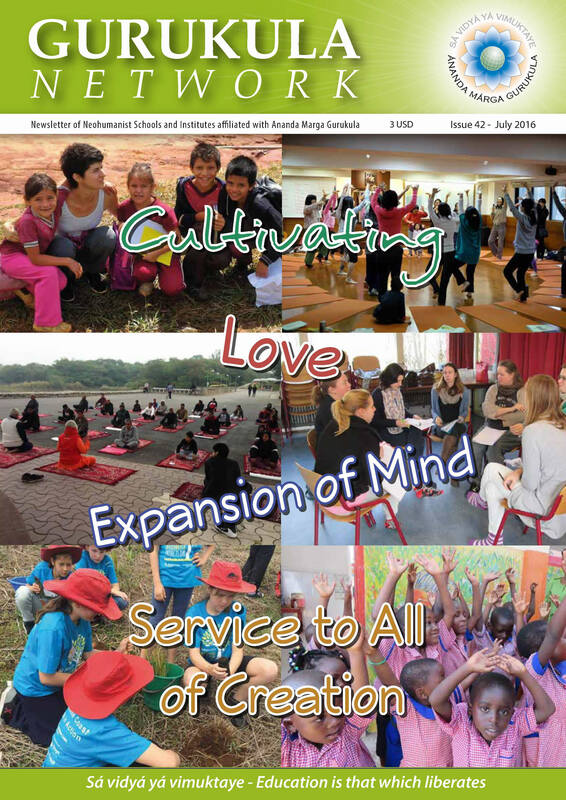 This is our standard school curriculum and without these activities something would be missing in the day. During the 30 minutes of the Morning Circle, we sing many lovely songs, which fill up our hearts and minds for a peaceful day. A few of the yoga postures like wheel pose and sitting on clouds are compulsory every day. Doing yoga makes them super flexible and energetic for the whole day while studying in school. Every Wednesday, we spend a full hour on yoga time and play lots of games related to yoga postures. The children and teachers laugh a lot and enjoy this activity very much. Whenever it is time for yoga, the children become excited: “We are going to do yoga”. They laugh and enjoy performing various animal postures. 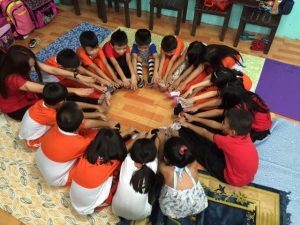 And the children become closer to each other by doing yoga in pairs and massaging each other’s backs in the circle at the end of the class. Yoga is a great way to release stress in school and an incentive to attend school. Once a week, Didi Subharatii teaches art. The children decorate and draw mandalas, use play dough to make many animals, fruits, food, the solar system, etc. They also do Nagomi Art by using the finger to draw with pastel color powder, and paint with water colors. Children become excited with arts. Every Friday, they listen to a story that highlights one of the principles of Yama and Niyama, according to the theme of the month. 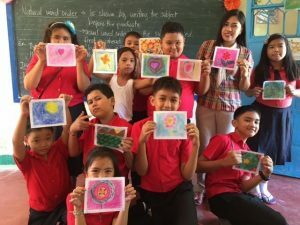 More than 30 teachers from the three AMSAI schools attended the “Education Training Course” last May, 2016, by Didi Ananda Aciira when she visited Mindanao. She taught us how to do storytelling, the importance of play in school, and awareness of love. 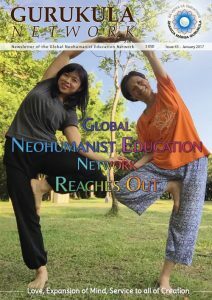 All the teachers were inspired by our ideology of Neohumanism and Yoga in school. On August 18, 2016, the AMSAI community held a mass feeding program which benefited more than 200 children. 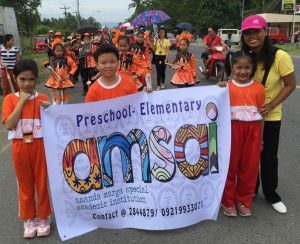 This program is an annual program of AMSAI Schools in Mindanao (Davao, Digos, Gensan). This time we served the children living near Lion Beach, where most of the children don’t have their nutritional needs met. The AMSAI parents donated hot pandesa, bread, milk, sugar, rice and cocoa powder. The school janitor cooked the champorado made of rice, cocoa powder and milk in the backyard while Didi Subharatii and others were preparing kalimanci juice and packing the bread to get ready for the mass feeding. The preparation took just one hour, as we are used to doing these activities every two months in school. When the food was ready our vehicles were also ready. The parent volunteers and others drove us to the places. As soon as we arrived, the children were already waiting with their cup and spoon in their hands. We quickly served the bread, porridge and juice while singing kiirtan. The teachers and AMSAI children were all sharing their hearts with the needy. 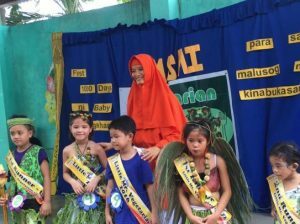 In July 2016, a Vegetarian Food Festival was held at three AMSAI Schools: AMSAI Digos Elementary, AMSAI Gensan Elementary and AMSAI Davao High School, Mindanao, Philippines. 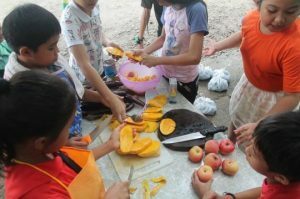 It was an annual occasion, as every July the Philippine government schedules a Nutrition Month to highlight a concern and to persuade the public to take action about it. This year’s theme was “First 1000 Days of my Appreciation for the Healthy Future”, which was very relevant to today’s problems locally and globally. The theme focused on the first 1000 days of life from conception and through the second birthday of the child. It is during this period that a child’s growth may falter. Many studies have shown a link between undernutrition, especially stunting, in the first years of life and overnutrition in the later years. Thus, the First 1000 Days have been called the “golden window of opportunity” for a comprehensive package of nutrition and related interventions to achieve significant reduction in child stunting, underweight and wasting, at the same time contributing to complete child development. The guest speaker urged parents to grow a vegetable garden at their homes and discussed the benefits of adopting a vegetarian diet. A talk on the importance of breastfeeding as a solution was given by Dada Mantrajapananda. It was not just the children who were excited in their performances of dances and songs; parents also eagerly participated in the table arrangement competition and games. They began work the previous afternoon setting up the background for the table arrangement and cooking. The children in all three schools participated in the contest of who would become Mr. & Mrs. Nutrition of the year. 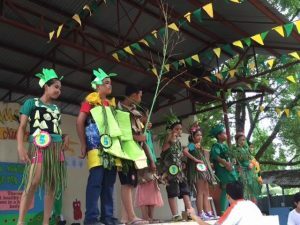 The children were decked out in creative and colorful vegetable and fruit costumes: carrots and lemons became their necklaces; string beans, cabbage, kangkong, malungai leaves became their skirts; coconut leaves and husks and banana flowers made fine hats and angel wings. The children easily learned the food groups. The science lessons became more interesting than ever. At the AMSAI High School in Davao, the children were the ones who prepared the lunch. They were the chefs in the kitchen canteen. The menu was vegetarian, presenting local and international dishes made with a Philippine flair: vegetable salad, barbeque, spaghetti, spring roll, chop suey, jackfruits with coconut milk etc. The cooked items were displayed on the tables. 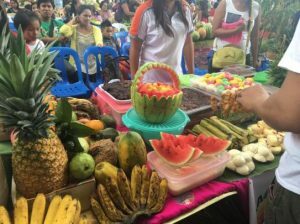 Some tables had six different tastes, another had something special cooked with local ingredients, some had indigenous drinks and all were complemented with creative fruit carvings. In short it was not mere nourishment, but food for the eyes too. Parents again showed admirable cooperation at the end of the event by cleaning and putting things back so that the next morning the school started as usual.